Focusing light at the nanoscale has become a key factor in super-resolution applications. Dynamic control of this focusing can open new avenues in nanoelectronics and bioimaging, but it requires a platform that merges electronics with super-resolution capabilities. We present a planar metal–oxide–silicon (MOS) platform that allows us to shape, tune, and focus visible light at the nanoscale by compressing the wavelength of light fourfold, resulting in a scaled diffraction limit of 65 nm. We exemplify the control and flexibility by demonstrating nanovortex beams and short-wavelength super-oscillations of light that further enhance resolution toward 35 nm. Our platform achieves focusing strength similar to nanoantennas but without structural hotspots; hence it is possible to scan the focus via optical wavefront-shaping techniques. Super-resolution scanning without mechanical translations in a MOS platform can provide a building block for bioimaging, nanolithography, and lab-on-a-chip applications. G. Volpe, S. Cherukulappurath, R. Juanola Parramon, G. Molina-Terriza, and R. Quidant, Nano Lett. 9, 3608 (2009). M. I. Stockman, Phys. Rev. Lett. 93, 137404 (2004). E. Verhagen, A. Polman, and L. K. Kuipers, Opt. Express 16, 45 (2008). H. Choo, M.-K. Kim, M. Staffaroni, T. J. Seok, J. Bokor, S. Cabrini, P. J. Schuck, M. C. Wu, and E. Yablonovitch, Nat. Photonics 6, 838 (2012). A. V. Kildishev, A. Boltasseva, and V. M. Shalaev, Science 339, 1232009 (2013). N. Yu and F. Capasso, Nat. Mater. 13, 139 (2014). N. Shitrit, I. Yulevich, E. Maguid, D. Ozeri, D. Veksler, V. Kleiner, and E. Hasman, Science 340, 724 (2013). D. Lin, P. Fan, E. Hasman, and M. L. Brongersma, Science 345, 298 (2014). A. Vakil and N. Engheta, Science 332, 1291 (2011). J. Chen, M. Badioli, P. Alonso-González, S. Thongrattanasiri, F. Huth, J. Osmond, M. Spasenović, A. Centeno, A. Pesquera, P. Godignon, A. Zurutuza Elorza, N. Camara, F. J. G. de Abajo, R. Hillenbrand, and F. H. L. Koppens, Nature 487, 77 (2012). B. Gjonaj, J. Aulbach, P. M. Johnson, A. P. Mosk, L. Kuipers, and A. Lagendijk, Phys. Rev. Lett. 110, 266804 (2013). B. Gjonaj, A. David, Y. Blau, G. Spektor, M. Orenstein, S. Dolev, and G. Bartal, Nano Lett. 14, 5598 (2014). 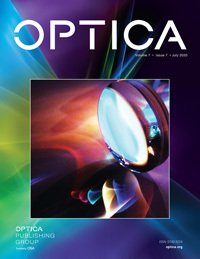 H. Yilmaz, E. G. van Putten, J. Bertolotti, A. Lagendijk, W. L. Vos, and A. P. Mosk, Optica 2, 424 (2015). G. T. Reed, G. Mashanovich, F. Y. Gardes, and D. J. Thomson, Nat. Photonics 4, 518 (2010). V. R. Almeida, C. A. Barrios, R. R. Panepucci, and M. Lipson, Nature 431, 1081 (2004). R. F. Oulton, V. J. Sorger, D. A. Genov, D. F. P. Pile, and X. Zhang, Nat. Photonics 2, 496 (2008). Y. Gorodetski, A. Niv, V. Kleiner, and E. Hasman, Phys. Rev. Lett. 101, 043903 (2008). T. Brunet, J.-L. Thomas, and R. Marchiano, Phys. Rev. Lett. 105, 034301 (2010). M. V. Berry and S. Popescu, J. Phys. A 39, 6965 (2006). E. T. F. Rogers, J. Lindberg, T. Roy, S. Savo, J. E. Chad, M. R. Dennis, and N. I. Zheludev, Nat. Mater. 11, 432 (2012). E. Greenfield, R. Schley, I. Hurwitz, J. Nemirovsky, K. G. Makris, and M. Segev, Opt. Express 21, 13425 (2013). M. I. Stockman, D. J. Bergman, and T. Kobayashi, Phys. Rev. B 69, 054202 (2004). A. P. Mosk, A. Lagendijk, G. Lerosey, and M. Fink, Nat. Photonics 6, 283 (2012). Fig. 1. 2D silicon platform for nanoscale shaping and control of propagating waves. (a) The platform is based on transparent thin silicon membranes, in the format of microscope slides or chips. (b) Carefully designed slits provide coupling of light into the guided modes and their focusing. The measured focus of 65 nm is represented in 3D. (c) Side view showing the excitation, counterpropagation, and mode profile of the guided modes. Visible light (λ0=671 nm) from underneath selectively excites short-wavelength modes (λSi=184 nm) only at the slits. The counterpropagation (ultimately focusing) is mapped via the evanescent tail of the modes, which interacts with a scanning near-field probe. Fig. 2. Focusing visible light in a 2D Si platform. Circularly polarized light is coupled into the waveguides and focused by an Archimedean spiral slit. (a)–(d) Focusing light within a Si-SiO2-Ag waveguide (thicknesses: 60 nm–4 nm–350 nm). The near-field maps of the measured amplitude (a) and phase (b) show symmetric focusing with a standing phase pattern. (c) The Fourier spectrum calculated from the mapped near field presents an uninterrupted circle yielding maximal numerical aperture for the focus. The radius, km=2π/λm, corresponds to a mode wavelength λm=184±5 nm. (e)–(h) Tuning by few nm the SiO2 thickness (thicknesses: 60 nm–7 nm–350 nm) allows control over the wavelength, propagation length, and focal brightness. The newly measured focus is brighter, resulting in improved SNR. The improved brightness and propagation length (4.9 μm) are accompanied by a slightly longer wavelength λm=221±5 nm. (d) and (h) We use the angular symmetry to angle-average the profile of the electric field. Such a profile fits the theoretical expectations of a J0 Bessel function, from which we establish (d) 65 nm and (h) 78 nm resolution for the 184 and 221 nm wavelength modes, respectively. The insets show close-up high-resolution scans of the focus (amplitude and phase). Fig. 3. Nanovortex in 2D Si platform. Guided modes (λm=184 nm) are focused into a dark spot via a circular slit and circularly polarized light. (a) and (b) Near-field maps of intensity and phase show dark focusing with spiraling phase, respectively. This focus holds nonzero angular momentum. (c) The angle-averaged intensity profile is fitted with the intensity of the first-order Bessel function (J12). High-resolution close-up images of the intensity and phase of the focus are shown in the insets. Fig. 4. Super-oscillations of two short-wavelength modes. Linearly polarized light is coupled into the two propagating modes of a Si-SiO2-Au waveguide (thicknesses: 160 nm–22 nm–170 nm). (a) and (b) The measured amplitude and phase, respectively, show the interference between modes. High-resolution amplitude and phase close-ups (insets) show super-oscillations faster than any propagating Fourier component. (c) The calculated Fourier spectrum of the field shows two waveguide modes of wavelengths λm,1=200±5 nm and λm,2=282±5 nm, and far-field background (the inner ring). (d) The averaged amplitude (black) and phase (red) profiles show 70 nm zero crossings of amplitude and phase. (e)–(h) A Fourier band-pass filter improves the visibility of the super-oscillations in both (e) amplitude and (f) phase. (g) The filtered Fourier spectrum contains only guided mode components. (l) The linecuts show amplitude features of FWHM=35 nm and phase flips of nearly 70 nm—clear signatures of super-oscillations. (i)–(k) Calculated near-field amplitude, phase, Fourier spectrum, and linecuts, respectively. The calculation well describes the measurement of super-oscillations.